The sporting world’s most exciting derby is set to take place later this Spring, with millions of fans tuning in to see the results. No, not the Stanley Cup Playoff: we’re talking about the 2019 NHL Draft Lottery. 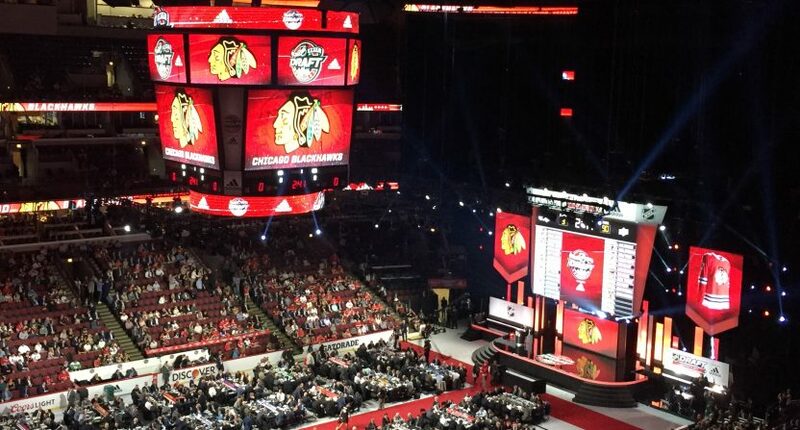 The first three picks for this June’s 2019 NHL Entry Draft will be determined on the opening night of the 2019 Stanley Cup Playoffs, April 9th. Currently, the Ottawa Senators have the best odds to win top spot in the lottery, but of course Sens general manager Pierre Dorion traded his team’s 1st round pick to the Colorado Avalanche in an ill-fated trade for the now departed star Matt Duchene. Should the Columbus Blue Jackets fail to make the post-season, the Sens will technically still have a chance at winning the first overall selection, but their odds drop from nearly 20% to just 1%. The prize at stake? That would be projected first overall selection Jack Hughes, a 17 year old product of the U.S. National Development Program. The 5 foot, 10 inch, 170 pound centre has battled Finnish winger Kaapo Kakko for top spot in scouting reports all season long, but most scouts seem to agree that Hughes will go first overall in June’s draft. Technically there are 15 teams in the Hughes Derby, but with the way that the NHL weighs lottery participants, it seems much more realistic that one of the NHL’s true bottom feeders will come away with the top pick. This means that Hughes is likely headed to either the Avalanche, by way of the Senators, Los Angeles Kings, Detroit Red Wings, New Jersey Devils or Buffalo Sabres. There’s an outside chance that the New York Rangers, Anaheim Ducks, Vancouver Canucks, Chicago Blackhawks or Edmonton Oilers overcome almost overwhelming odds and win the Hughes Derby, but let’s focus on the most likely destinations. Of the Avs, Kings, Red Wings, Devils and Sabres… who most deserves to win the 2019 NHL Draft Lottery? Let’s be real here… the Senators deserve this pick more than anyone. Had Dorion been elected to hand over his 4th overall pick to the Avs last offseason and passed on selecting Brady Tkachuk, the Sens would be the ONLY correct answer to this question. They’re dreadful and desperately need a player with Hughes’ superstar potential to drag them out of the mess they’re in. As it is, Avs GM Joe Sakic will step to the podium in Vancouver at the draft to make a selection for his team on behalf of Dorion and his blunderous move. As great as one-two punch as Nathan MacKinnon and Jack Hughes would provide the Avs with moving forward they don’t really “deserve” the pick. MacKinnon himself is a former first overall pick, captain Gabriel Landeskog is a second overall pick and the Avs were a playoff team just a season ago. They’re in a dog fight to make the postseason again this year and seem to be on the rise. They don’t deserve this. Not even close. Oh, how the mighty have fallen. The two-time Stanley Cup champion Kings didn’t just go into a slide this season, they absolutely fell off a cliff. The warning signs should have been there for GM Rob Blake last season when his team was easily swept by the Vegas Golden Knights in the first round of the 2018 Stanley Cup Playoffs. The Kings are too old and too slow to compete in the younger, faster NHL of 2019. Yet Blake doubled down on veteran talent in the offseason by signing 35 year old Ilya Kovalchuk to a ridiculous three year, $18.75 million contract. Nearly every impact player on the Kings including Anze Kopitar, Drew Doughty, Jeff Carter and Jonathan Quick is on the wrong side of 30 and there is no denying the fact that the team could desperately use a blue-chip prospect like Hughes in their system. But… with two Cup wins in the past six years, the Kings simply haven’t suffered long enough to deserve a shot at drafting first overall. After 25 consecutive playoff appearances from 1991 to 2016, the Red Wings seem intent on putting together a new streak in HockeyTown these days. The Red Wings will fail to qualify for the playoffs for a third consecutive season and after picking 9th and 6th in the past two drafts, Red Wings GM Ken Holland is hoping for some luck at the draft lottery on April 9th. The Wings were extremely fortunate to have Czech sniper Filip Zadina fall into their laps at last year’s draft and Wings fans can’t help but dream of a Hughes/Zadina combo to help lead their rebuild. The Wings haven’t selected first overall since taking winger Joe Murphy with the top pick in the 1986 NHL Entry Draft, three years after lucking out on getting franchise icon Steve Yzerman at 4th overall in 1983. So, it’s been awhile since they’ve been at the top of the draft, there’s no denying that. Over a decade removed from their last Stanley Cup victory and have largely been irrelevant for half a decade since… maybe they deserve this pick? Then again, the Red Wings have had stretches of dominance throughout their history that would make most fanbases cry. Sorry, Wings fans, you don’t deserve Hughes just yet… but maybe Stevie Y will come back this summer and make things right? After a nearly two decades run as Stanley Cup contenders and with three Cup championship banners hanging in the Prudential Center, you won’t find many hockey fans who feel for the plight of Devils fans. The Devils hit the jackpot when they won the 2017 NHL Draft Lottery, moving up from the 5th overall selection to take Nico Hischier first overall. The summer before they stole former first overall pick Taylor Hall in a lopsided traded with the Edmonton Oilers. They’ve got Cups. They’ve got first overall picks in the lineup. Next, please. In any case, of the NHL’s bottom five teams, nobody deserves the top pick in this June’s draft more than the Buffalo Sabres. Yes, they picked first overall just last June and grabbed franchise defenseman Rasmus Dahlin. Yes, they have two second overall picks in Jack Eichel and Sam Reinhart already on their squad. BUT, most fans and analysts seem to agree that the Sabres, despite a tough back half of the season, are on the upswing. Adding Hughes to a young core that includes the above-mentioned players along with Casey Mittelstadt and Alex Nylander, should be enough to finally propel the Sabres into the post season. The Canucks currently have just the eighth best odds to win the 2019 Draft Lottery at just 6% and are outside of the NHL’s bottom five, but they deserve this pick so much that I had to include them. In their entire 50-year history the Canucks have NEVER picked first overall, instead they’ve settled for second overall in four occasions picking Daniel Sedin, Petr Nedved, Trevor Linden and Dale Tallon. By virtue of this they’ve missed out on top picks like Owen Nolan, Mike Modano and Gilbert Perreault. Ouch. In recent years the Canucks have drafted well and, as a result, they have a stable of good young talent on their roster. Elias Pettersson, Brock Boeser, Bo Horvat and Jack Hughes’ older brother Quinn Hughes appear set to lead the Canucks forward in the next decade. How great would the younger Hughes look on this team playing alongside his brother? With Pettersson, J. Hughes and Horvat down the middle, the Canucks would be stacked at the centre ice position with three of the best young players in the game. Throw in the fact that this June’s draft is hosted by the Canucks at Rogers Arena and it makes this entire exercise a no brainer. No team deserves to win the 2019 NHL Draft Lottery more than the Vancouver Canucks.